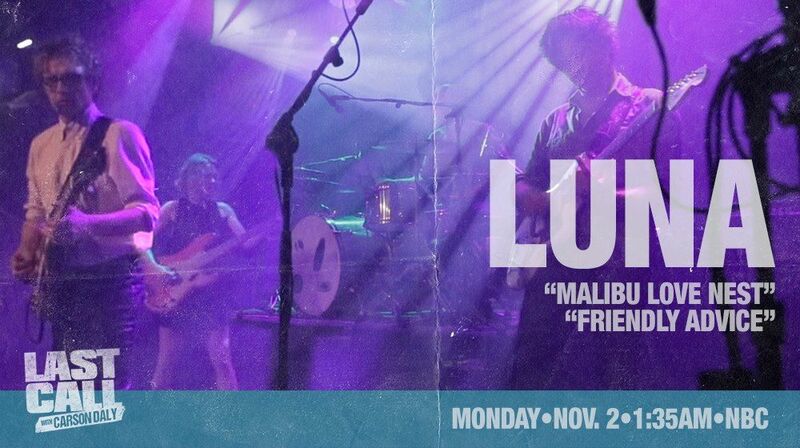 Firstly on Monday 2 November some excerpts from one of Luna's recent performances in Los Angeles will be broadcast on the Last Call with Carson Daly TV show on NBC. The show airs at 01:35 (so technically it's the early hours of Tuesday morning) - so set your VCRs or whatever your modern equivalent is! The above image, pilfered from Luna's Facebook page has the details. This could well be Luna's first TV appearance since playing on the John McEnroe show way back when... here's a clip of them playing Speedbumps and then being joined by Superbrat on a cover of Sweet Jane. ... then on Thursday 5 November the band will be playing a live radio performance for KEXP in Seattle… and I imagine that will be streaming live video too. The last time they were at KEXP was I think in 2002 supporting Romantica - you can hear that show here... if your device can manage the out-dated format!